Why, yes. 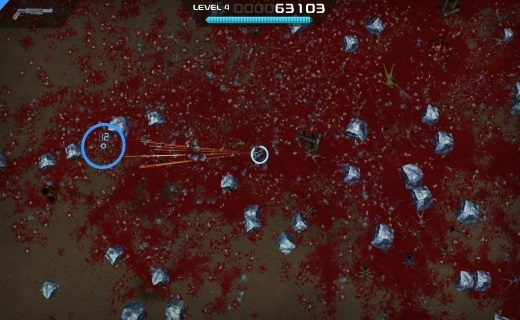 Crimsonland does sound like a generic, craptacular, low-budget horror movie. You know the sort of thing: drunken youths wander about an abandoned amusement park at night and everybody wonders who’s going to have their pancreas impaled by the crazed killer first. Well, fear not. That’s only kinda sorta the deal here, and in a good way anyway. 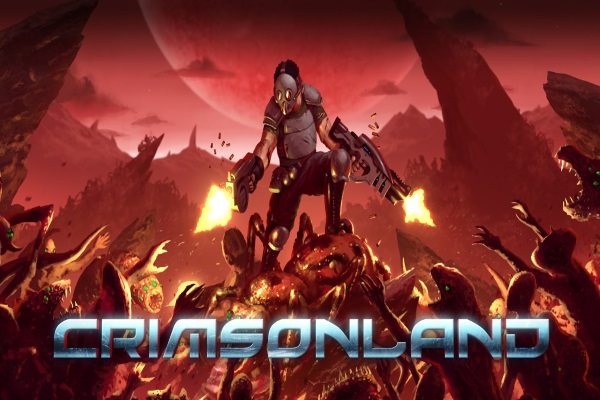 Crimsonland is, in fact, a twin stick shooter from 10tons Entertainment. It first hit the PC in 2003, and has just this month made it to PS Vita and PlayStation 4. By all accounts, it’s a rather generic entry in the genre, but there are some brilliant touches that set it apart. Let’s take a look. As a tiny space-dude (and on the Vita screen, as a really freaking tiny space-dude) you have one simple objective. Namely, to murderize. You appear in a series of arenas, are beset by all manner of nasties, and must dispatch them before they do the same to you. If you’re familiar with the likes of Robotron and Smash TV, you’ll know the score. Mostly, it’s the variation on this basic concept that keeps the game appealing. In one mode of the original release, your character was stationary, and you defeated the encroaching horde by typing out the words above their heads. It was a fun little throwback to Typing of the Dead, and an example of the cheeky, slightly crazy spirit that runs throughout the game. Man that’s a violent screenshot. Hence the name. The first mode on offer in the PSN edition is Quest. This is a procession of sixty stages, divided into chapters. Don’t let that fool you into thinking there’s a story going on here, though, because there isn’t. Not a bit of it. Instead, this is where you unlock perks and weapons for the meat of the game, the survival modes. There’s the regular vanilla version, a blitz variant in which you have only an assault rifle, one with limited ammo and scarce one-use weapon pickups, and more. You gain experience for destroying the monsters, and can pick a perk with each level you reach. While this is all rather standard, I enjoyed the quirky humour and imagination that went into naming these abilities and describing their effects. As quite a fan of twin stick shooters, I’d have to say this is one of the best I’ve played for some time. The weaponry is weighty and varied, and there are a lot of them to choose from. Quest mode is quite large too, and actually warrants play with the way that the unlocks work. It’s a fairly obscure download title, but it’s one that fans of such won’t want to miss out on.